Whether your residential garage door or operating device needs repair or replacement, A Always Open Garage Doors has a broad range of products and services available to meet your garage needs. We understand budgets and give you several options and pricing for your repair or replacement. We also understand that it takes a professional to evaluate repairs. We service all makes and models. Our success is based on the philosophy that we provide prompt, courteous service at everyday fair prices, with a 100% SATISFACTION GUARANTEE. Garage door repair is an umbrella term that encompasses a range of repairs that your garage door may need. These repairs include broken cables, opener, circuit boards, remotes, and springs. Door motors have increased in reliability throughout time, but they still require attention. With proper care and maintenance, the motors should be worry-free for years. However, these motors are put under intense stress and tension over time and some of them result in failure. With a skilled technician, motor issues can be resolved and repaired to save you money by extending the life of your opener. A common issue is with the garage door opener itself. After years of operation, openers can experience issues with an electric short or a dead circuit board. If these issues are taken care of early on you can save money and prolong the life of your opener. Garage door remotes, keypads, and wall controls are paramount to the operation of your opener. Once the wiring and programming are in place, the only required maintenance should be battery replacements for the remote. This isn't always the case. With surges and shorts occurring to your electrical grid, you may experience malfunctions in these installations. A Always can service these issues to ensure extended life and use of your garage door. Misaligned tracks and rollers are not just an inconvenience to the speed, they can be a serious issue. If there are gaps between the rollers and rail or bends in the rail, this is a common sign that the tracks are not centered. The weight of the door combined with these issues can become dangerous to operate your door. Doors that work but are unable to open or close at a certain point are generally caused by obstructions. The reversing mechanism that prevents the door from crushing objects in their path will refuse to close or open the door if it senses something in its path. Debris, mud buildup, or even small objects can obstruct the operation of the door. With proper removal and cleaning, these procedures will allow your door to become operational again. Garage door panel repair or replacement are often needed due to the wear and weather conditions. Regular maintenance can prolong the life of the door; however, the harshness of the weather is not easy to keep up with. For instance, rain and wind that carry debris and other material can ding fiberglass and aluminum panels. Wood doors on the other hand can contract and expand due to the weather. Proper insulation of panels can cool down the garage area saving you money on your electric bill. The insulation also acts as a buffer between you and the outside world by tuning out the noise. If the time has come to replace or repair on your garage door panels, call today to discuss your available options. The latest advancement in technology are not limited to computers and phones, they are in garage doors as well. Newer garage doors provide higher quality of material, durable structures, insulation, and energy saving mechanisms. Garage doors come in a variety of styles and configurations. We can also help you with your custom garage door and installation. Steel garage doors are stronger than wood, aluminum, and fiberglass. With wood-grain patterns, durable coatings, modern steel garage doors resemble the look of classic wood garage doors but without the maintenance. Unlike classic garage doors, steel doors are not prone to crack and fall apart due to the weather. Galvanized steel doesn’t rust or require repainting as often as wood doors and most warranties cover them for the length of home ownership. A premium choice of steel doors have rigid polystyrene foam insulation. This keeps the garage warm in the winter and cooler in the summer. The quality of steel doors can be determined primarily by the thickness. Higher quality steel doors are often 2 inches thick and filled with insulation and in 24-gauge steel. Lower quality materials tend to be thinner and made of 28-gauge steel. The best doors have vinyl bubble garage door weather-stripping throughout the bottom edge of the floor and rigid vinyl along the sides of the door panels. The compromise with steel doors is that they are heavier and require stronger motors and springs. Single-layer: there is just one layer of fiberglass between steel or aluminum frame. Double-layer: feature insulation between two layers of fiberglass. The insulation aids in energy efficiency and reduces the level of noise transfer between the outdoor and indoor environment. Triple-layer: insulation between each layer of fiberglass. This is the most energy-efficient and strongest type of fiber glass option found in premium selections. Fiberglass doors are also resistant to termites and are able withstand small dents and dings. Most applications of fiberglass are not favorable in warm or cold settings due to being a poor insulator. If exposed to cold temperatures, fiberglass doors will break relatively easy. High winds can also damage the panels. Wood doors are a classic look that many people prefer. The natural look and affordability are appealing factors. Wood doors can accommodate the look and feel of the house with customized shapes and sizes. Wood doors are great insulators and can save on heating and cooling costs. The insulation also helps with keeping the outside noise from being disruptive. However, there are drawbacks with wood doors. Wood expands and contracts especially when exposed to alternating temperatures of hot and cold. These drawbacks require regular maintenance, repainting and refinishing every few years. Wood doors are also prone to termite infestation. 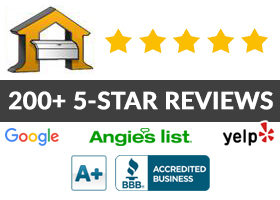 "I have recommended A Always Open Garage Doors many times. I have been using Mark for about 15 years. He understands the emergencies people have when they can't get in or out of the garage. It's the best service. They couldn't be better." We offer 24 Hour Emergency Service because we understand that not all door problems occur during business hours. We are ready to respond 24 Hours a Day, 7 Days a Week. Call us today to schedule your garage door repair or installation. Serving the East Valley for over 17 years.